Odds are pretty good that what first brought you to The Escapist was a fast-talking brit with a sweet hat and a chip on his shoulder. Ben "Yahtzee" Croshaw is pretty famous around these parts, but he's not exactly the warm and cuddly type. He doesn't comment in the threads for his videos, he rarely answers fan mail, and he's hardly ever seen outside his home of Australia. And now you have the chance to make him dance like a monkey at your command. Commence cackling with evil glee and/or stroking a white Persian cat. Ok, the dancing is a bit of an exaggeration, but you can make him hang out with you, put you in one of his videos, or even review your game. 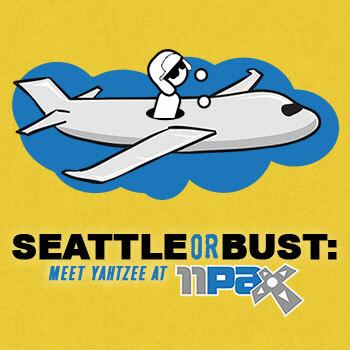 The Seattle or Bust campaign has a very simple goal: pry Yahtzee out of his Australian lair and fly him out to PAX Prime. In exchange for your contributions, you can receive everything from a limited edition, autographed poster to a seat at Yahtzee's VIP table at our PAX Prime Super Colossal Meet Up of Excellence and Wonder. Keep in mind, this campaign only lasts 15 days, so if you want to participate, you'll have to hurry! If we exceed our campaign goals, The Escapist has some exciting plans for Yahtzee and our East Coast community. So stay tuned for blog updates if that happens! KEEP IN MIND: The Escapist is NOT providing tickets to PAX 2011, nor are they paying for your trip in any way. Sorry! Full disclosure: The campaign goal includes travel, lodging for Yahtzee and Escapist staff, securing community meet-up venue and hard costs for production of merchandise and other rewards. UPDATE: There's been some confusion about what exactly we're trying to achieve. As any of you that have seen us at PAX know, we typically only send a small contingent of Escapist staff. We're hoping to do something bigger and better for PAX Prime - a grand meet-up that includes food, beverages, and Yahtzee. This is not a charity drive. We are pre-selling merch and swag and if we hit a minimum threshold we'll make a big presence at PAX. If we don't, the orders will get cancelled, we'll have our usual spartan presence at PAX. Check here for all the details and rewards.